Happy Birthday Lois Ehlert - November 9, 1934! It has been quite a long time since I have posted to my blog. I have renewed interest in writing about my passion for reading great children's literature. Actually, the renewal fee came due for the web domain name, so it forced me to go back to my blog and I noticed that the time of year fit right in line with where I leftoff with the blog on Crockett Johnson. I am writing this blog to celebrate great children author's birthdays. I used to teach fourth grade students with reading difficulties. For a few years I used the author's birthdays as a way to introduce a variety of writing styles and topics to my students. Now, I am currently out of the teaching profession and staying at home with my children. I left my blog when was son was about 1 month old and life got busy. Things have slowed down considerably and we are into our routine, so hopefully I will be able to continue this blog. I feel it will be great for my kids to be exposed to the variety of books that I will discuss in this blog. This week it is a perfect time to celebrate Lois Ehlert's birthday. Many of her books focus on nature and things you can observe around your house - at least here in the midwest. I just read the following books to my daughter from Lois Ehlert that were perfect for the season: Feathers for Lunch and Nuts to You . There are also other fall titles like Read Leaf, Yellow Leaf and Leaf Man . One of her newest books, Boo to You , is also very good for the Halloween and harvest season. This fall we put up a couple bird feeders in our yard. We placed it close to our sun room so we can observe the birds coming and going. We have enjoyed identifying the birds and learning the names. Feathers for Lunch is a great book to accompany your backyard bird feeder. It introduces 12 types of birds that might come to your backyard. The story is about a cat that is bored with its cat food and would love to eat a bird. However, it never succeeds and only is able to get feathers. Throughout the book Ehlert presents the different types of birds in her artistic form of collage, sticking pieces of paper together to form an image. There is also facts about the birds at the end. Nuts to You is another great book that fits with the bird feeder idea. We have quite a few squirrels in our neighborhood and when we first put up our bird feeder they became quite interested in the seeds that were falling on the ground. Later, I acquired some sunflowers with the seeds from my grandfather. I tied them to my bird feeder set up and the next thing I knew the squirrels were scaling the pole to get to those seeds. I would not be defeated, because ultimately these seeds were not for the squirrels but for the birds. I ended up rigging a plastic coffee can around the pole so the squirrels couldn't come up. 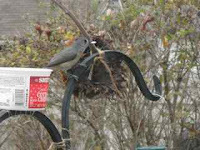 It worked and now I have tufted titmice coming to get seeds every morning. Ehlert's Nuts to You is about a squirrel that ventured through the apartment window and how peanuts were used to get it back outside. I just got Boo to You from my local library. It is about a couple of mice that are harvesting seeds and various other treasures. However, there is a pesky cat that they are concerned might ruin their harvest party or worse, eat them! Luckily the mice are able to scare the cat in the end and save their feast. The book was great for my daughter because we just went to the pumpkin patch with her preschool class and got a few gourds. We were able to identify xeroxed copies of gourds that Ehlert used in her collages. Also, we quickly identified the cat's teeth as pumpkin seeds from our recent pumpkin carving. Lastly, Lois Ehlert also has a book, Snowballs , that is about building a snow family and decorating them with goodies. But, I am not quite ready to be thinking about snowmen and more importantly, shoveling snow! I hope you check out many of Lois Ehlert's fall books and maybe create a collage or two! Click Here to read the 2010 Lois Ehlert Birthday post!